This walk: 2012-5-24. Bedford or Magpie Bridge, possible crane base, River Walkham, Mallard drake, Gem Bridge, hawthorn, Gem Cottage, bluebells, Screw Bridge, Common, English or Pedunculate Oak tree, Great Staple Tor, bracket fungus, dry stone walling, buttercup, Magpie Viaduct. 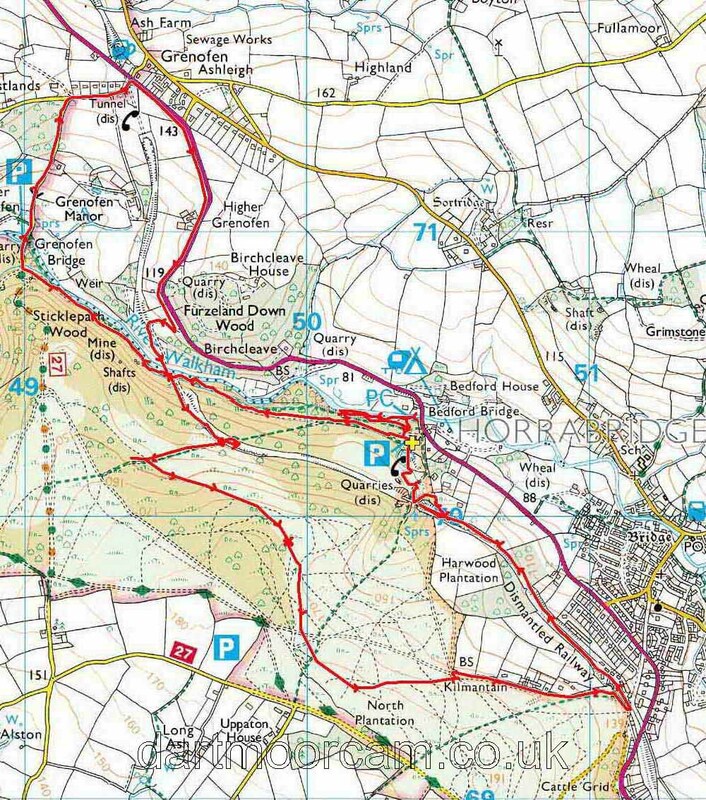 Previous walks in this area - 26 Jan. 2011, 6 Nov. 2011 and 28 March 2012. Bedford or Magpie Bridge over the River Walkham, built 1822. There was a tall white building to the right, which was the King's Arms in 1850 but Crossing knew it as The Magpie Inn. Nearby Magpie Mill produced violin strings. This area is also rich in remains from the Wheal Franco copper mine, 1823-1875, which was very productive, employing around 130 men and going down to 160 fathoms (960 feet). There was also a brick works in this area. Probable spoil from the Wheal Franco Mine. A feature of unknown function but suspected to be a base for a crane, being very near the river bank, although we thought the river today is definitely too shallow for navigation. River Walkham ..... walking north. Collapsed stream running down to the river near the car park. The new Gem Bridge at the site of Brunel's old Walkham railway viaduct. The scene has changed compared to 26 Jan. 2011, when there was a footbridge for walkers. Another view from under the bridge. River Walkham, looking towards Horrabridge, below the new Gem bridge. Unusual structure, with possible sluices and a bypass route, at left of photo, for fish? Notice board about the new bridge, click for a larger view. Looking alongside the outer aspect of the bridge. Looking up the Walkham valley, eastwards. Screw Bridge, possibly a corruption of Skew bridge, where the bridge does not go straight across the obstacle but at an angle? The bridge is also unusually sloped across the old railway track, which is the South Devon & Tavistock Railway (1859) with five viaducts and three tunnels: the line closed in 1962. Looking back to the bridge. Looking down on the now-finished track. A Common, English or Pedunculate Oak, Quercus robur. The flower and acorn are on a stalk called a "peduncle" whereas on the sessile oak, Quercus petrea, they are borne directly on the twig. In this oak, the leaves have small basal lobes where they join the stalk which are absent in the sessile oak. Great Staple Tor (centre) with Middle Staple Tor (left). Zoomed view to Gem Cottage. A bench under a shade tree. A block of gorse recently cut into blocks to encourage the very rare High Brown Fritillary Butterfly, click here for a larger image. Name plaque on the last house in the road. A view along the cycle track. A sample of dry walling. Magpie Viaduct ..... 216 yards long, 62 feet high, originally built 1856-1859 by Brunel, replaced 1902 with blue Staffordshire brick. Brunel's original brick-built piers can still be seen to the left, these supported timber trestles that carried the track bed. The viaduct is now part of the "27" Sustrans cycle track. Blue Staffordshire brickwork on the replacement Magpie Bridge. Distance - 9.6 km / 5.97 miles.